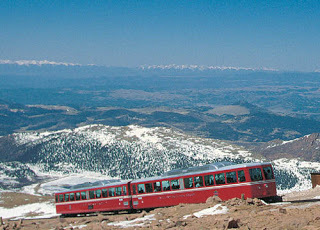 For those of you who love to visit Colorado Springs, Manitou Springs, and the Pikes Peak region, you may have taken the Pikes Peak Cog Railway up to the top of Pikes Peak, America’s Mountain, where the song “America the Beautiful” was inspired. Or if you had planned to take it, you will unfortunately not be able to take the train to the top for the unforeseen future. The Broadmoor hotel, owners of the railway, announced earlier this year that the railroad has “run it’s course” and will no longer be in operation. But, there are other ways to get to the 14,115 foot summit of Pikes Peak…. You can hike up to the top either from Manitou Springs and the Barr trail, or from the back side of Pikes Peak via the Crags trail. OR, you can drive up to the top. Rocky Mountain Lodge & Cabins is conveniently located just on the other side of the highway from the Pikes Peak toll road. It is less than a five minute drive to get to the toll gate. You can avoid the traffic on Highway 24 coming up the Ute Pass and stay at our Lodge, Cabin or Cottage and be conveniently located and save yourself up to an hour of traffic time by staying with us. Something else to note for the summer of 2018… they are doing some remodeling at the summit and have shuttles to take you up to the top this year. You still have to drive through the gate, but at mile 7 there is a parking lot and shuttles will take you up. So if you have avoided driving up because you don’t want to make the actual “drive” you are in luck this year and can take the shuttle. It runs about every 10 minutes, so the wait time is not long. Guests should be able to drive up to the summit themselves in 2019. So check our availability calendar, make your reservations, skip the traffic while staying with us, and enjoy the spectacular views at the top of Pikes Peak “America’s Mountain”. This entry was posted in Uncategorized and tagged Area Attractions, Miscellaneous, News, Things to do in the Pikes Peak Region, Tips & Tricks by Debbie Reynolds. Bookmark the permalink.